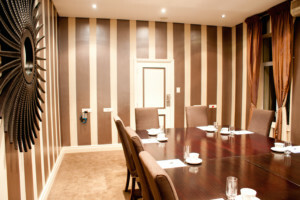 Our private boardroom is perfect for small conferences, meetings, brainstorming sessions or presentations. 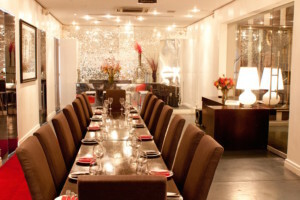 We can accommodate a maximum of 16 people when no presentation set-up is needed, or 12 with a presentation. We include a standard projector screen and data projector, flip chart, pens, notepads and a whiteboard. Catering is available as an extra at an additional cost. Please contact events@granddaddy.co.za to enquire with regards to rates, dates, catering and any other information you might require. 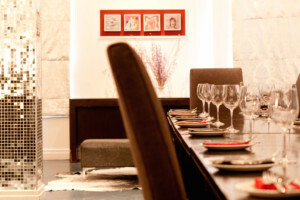 Perfect for conferences, meetings, corporate dinners, cocktail parties, launches or as a gallery space for exhibitions. We have a maximum capacity of 35 people in boardroom-style seating, U-shape seating and schoolroom-style seating. We can accommodate 70 people in cinema-style seating, 60 people for seated dining, and 120 for standing-only cocktail functions. Included in conference bookings are a standard projector screen and data projector, flip chart, pens, notepads and whiteboard. Extras are available at additional costs, such as catering, servers, bar staff and security. 10% service charge on all food and beverage services. Extra security is compulsory for all evening events and charged at an additional cost. No live music or DJs are allowed in this venue. Only background music, using our in-house system, is permitted. Booking The Venue requires a minimum bar spend of R3 000. Please contact our events department at events@granddaddy.co.za for more information on rates, availability, catering and bookings.